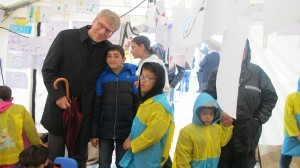 Representatives of the World Council of Churches visited Greece 14-18 October 2015 to strengthen efforts in support of refugees in Europe and the Middle East. The WCC solidarity visit was hosted by the The Ecumenical Patriarchate of Constantinople and the Church of Greece. Photo: Marianne Ejdersten / WCC. If you would like a speaker to come to talk to at your place of worship or as part of a local interfaith or ecumenical group, please contact us. Church of Scotland members are encouraged to give to A Place at the Table which supports the National Evangelical Synod of Syria and Lebanon. United Reformed Church members can support the National Evangelical Synod of Syria and Lebanon through their funding appeal. Methodists can give to the World Church Relationships Office Methodist Refugee Support Appeal and All We Can’s Syrian refugee appeal. The Jewish Council for Racial Equality have helped to set up the Support Refugees website, with a list of charities (both faith-based and non-faith based) to support. Both Christian Aid and SCIAF have issued refugee appeals for money.